The recent disclosures from Kent Dunn on the assault on the Cabal and their underground hideaways sent shock waves through the world of alternative media. These developments have been both eye-opening and somewhat exciting to read about for many. Many of us have waiting for what seems like half a lifetime for developments such as these to take place. So to finally witness such progress is understandably satisfying. Yet, even still, it is important for each of us to be patient and attentive so that when further details emerge, we can examine them, discern them, and respond accordingly. 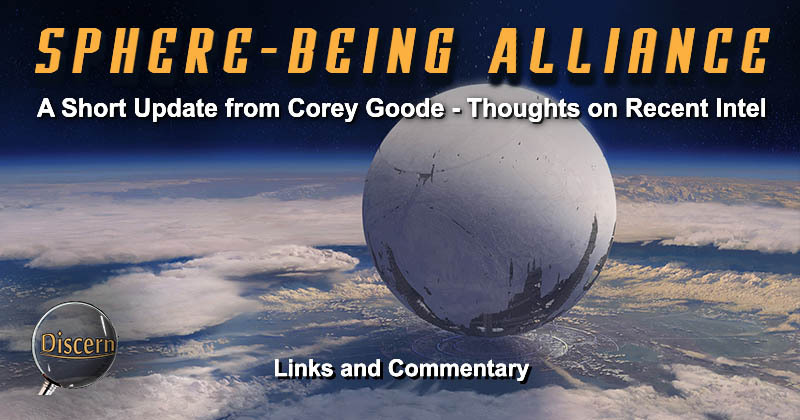 This is a short update from Corey Goode that was actually published in early November. However, I feel it reveals quite a bit about Goode's desire to be more forthright with the public on recent developments. The Cabal is on the ropes and panicking": There was a number of things that I was unable to share in my recent update that I hope to be able to share soon. Some of that information involved a few details about negotiations for sanctuary for Secret Earth Syndicate members who work more in the public eye. It appears that they now expect to have to flee from prosecution in the near future. To restate a previous point, it seems that Corey Goode wants to say more. However, since operations are ongoing, it is important to maintain the element of surprise. In this way, the Alliance forces will be able to execute their operations without telegraphing their future moves to the fleeing Cabal. If I understand battle strategy, I would imagine that the intelligence we gained from Kent Dunn was disclosed because it was deemed safe to do so by those feeding this information to Dunn. If this is the case, the operations and the tactics used were most likely successful. After such disclosures, the tactics of the Alliance may be changed to any number of strategies—each designed to catch the Cabal off guard and to ensure the most efficient completion of each operation. We may think of the situation as a football game. Each commander of armed forces has a playbook of sorts. As long as the opposing team does not see the home team's playbook, there is a good chance of consistently gaining yardage on the opponent. According to Dunn, the Cabal is basically blind to the outside world This is said to be due to the tactics of the Alliance forces in jamming the Cabal's sensory systems with ultrasonic technology. This makes assaults on their underground bases relatively simple and easy to accomplish. However, the battle is not over. It is up to each of us to ensure that we maintain the vision of the highest, greatest, and most beneficial outcome of this situation for everyone. In this way, we can help manifest a world in which we all prosper. Thank you so very much for your dedication to humankind.